The rich, fat and warm sound together with the well thought out functions makes the pedal one of the most clever, yet intuitive delay pedals out there. Both delays have wide range Tone controls for dialing in the perfect setting. Switch between the two delay channels or combine both together for huge dual-delay sounds. Keeping the On/Off switch depressed for 1 second brings you an exciting rhythmic multi-head mode. A must-have for all instrumental rock and Pink Floyd fans.Tap Tempo function is also included for use on the Long delay channel. 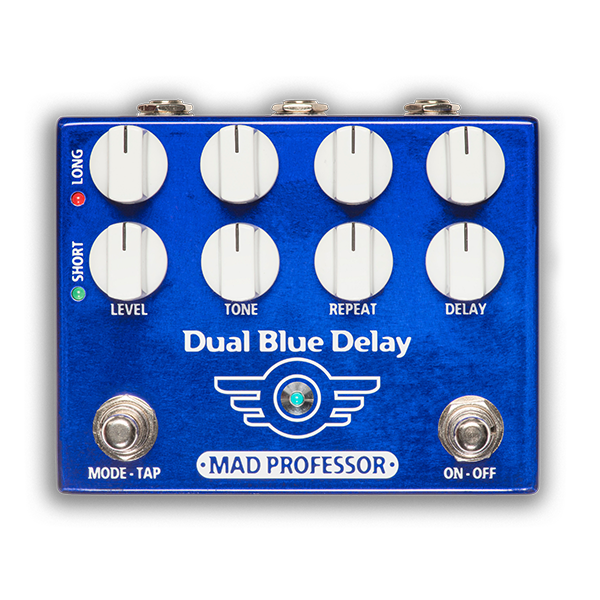 Dual Blue Delay is a powerful and intuitive pedal for the progressive musician.